Vedic "Agratys Magical Watch" - a unique transcendental creation that can completely change your destiny belongs to the field of watchmaking and it is designed for use in watch dials. The peculiarity of the Agratys Watch is that it reflects in the astrological sequence the entire Vedic Pantheon of the Gods of the Solar dynasty, in its exact correspondence and hierarchy. The reborn artifact in the form of Agratys Vedic Watch is a sacred family amulet that gives the opportunity to return to the ancient Vedic traditions of the descendants of the solar dynasty of earthlings. Thanks to the Watch you will discover the mystery of theurgy, the Yagic ways of self-cognition and the ancient name system - the “Imenoslov”, which was created from the transcendent in living Russian measures and can help you to find out your real divine name. Indication of solar phases according to the Agratys Vedic Calendar fully fits with any analog clock mechanism – that means that the model developed by us can be used in any clockwork. The only difference is that according to the Vedic calendar, the day (and year, including) starts from the 1st hour (1st month, July) and has a duration of 24 hours, respectively. But just such a time is the transcendental, the absolute, the true. The manufacturing of each model takes from a week to a month of thorough work - this is not a conveyor production, stamping typical goods, absolutely free of soul. Agratys Watch is handmade by the real master, in accordance with all traditions and technological norms, with good energy and positive thoughts. The bas-relief of the Watch is created by reverse casting from the special impact-resistant material on the removed model. This technology is quite time consuming, because the master has to "conjure" individually over each model in unlimited time frames, while the model becomes perfect. The watch can be made as a bas-relief, or a calendar tool with any drive (mechanical or quartz) according to special sketches or according to your wishes. 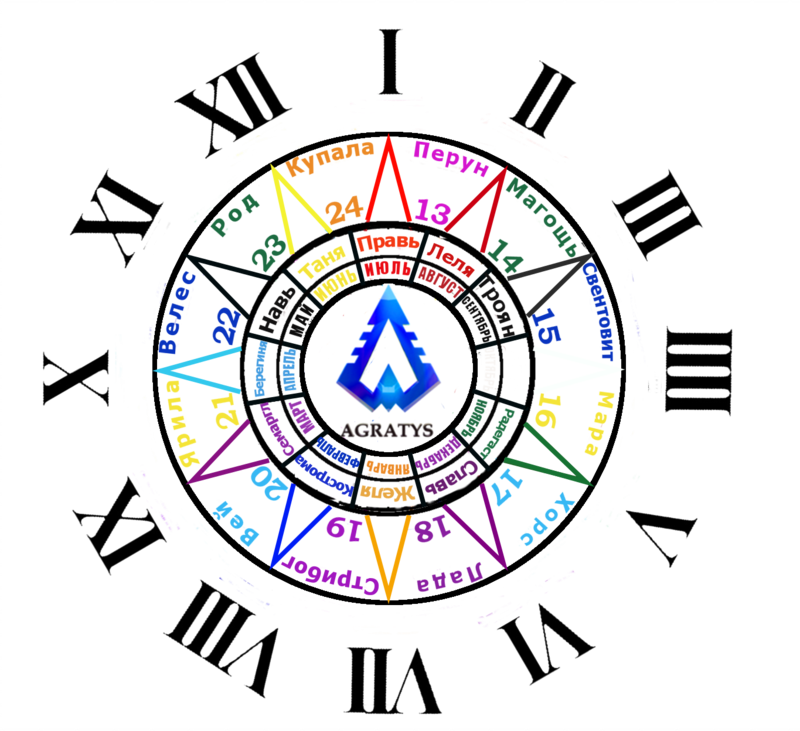 Also there is a variant to conclude an agreement on production of the special Agratys Magical Watch, it implies an individual design and guarantees the acquisition of Agratys Magical Watch, made by the hands of real "Warriors of Light" in a single copy. We can specially decorate your watch with your talismans, or medallions with photos of your family members, or inscriptions that are of special importance for you. Agratys Watch is a real family talisman and a bright symbol of the revival of the ancient Vedic sacred traditions, enclosed in the images of the Slavic patron gods, understandable and close to any person of the solar dynasty. Order our Agratys Magical Watch and present it to your friends, give it to your relatives, gift it to your children, bestow it to your spiritual mentors, grant it to your bosses and colleagues, so that as many people as possible get the opportunity to properly arrange their destiny (dharma) and pass exactly the way which they are destined to pass. The amulet will shape your and their destiny in the high vibrations of righteousness, mercy and holiness. Ordering our watch-mascot, you, thus, sacrifice peacefully to your patron gods, showing that you are ready to make friends with them. Wake up your Gods, and then your artifact will start working, begin to create real magic all around you and happily transform your destiny and the destiny of your loved ones. Vedic "Agratys Magical Watch" will become your guiding star, helping to deny all the impious and destructive things, to comprehend true wisdom and to find harmony with the inner and outer world. As you know, self-awareness comes through self-enlightenment. In the East, for example, the learned sages call self-awareness (self-determination, self-identification) "samadhi". Samadhi is the subtle process of transforming the "Mowgli" into a human being and his attempt to achieve the level of the Gods, his ancestors. Many truths, such as awareness of one's own essence, faith in the righteousness, mercy and eternal existence of one's personality (the divine particle), the ability to achieve Immortality and Divinity, are realized by man only through natural self-cognition and self-determination. - Do I exist or not? - How can I achieve Immortality? - Do I have the opportunity to become God? If you do not have answers to your questions yet, it does not matter. What is really important is to seek and search knowledge and be open to the voice of the gods. Agratys Vedic Calendar is an egregor, a relic that can trigger the process of your self-enlightenment and self-improvement, and it will lead to harmony, purification, happiness and the attainment of divinity. Awareness and self-perception is the only way to understand the truth. The descendants of the Solar Dynasty always realize their eternal Home, their blood relationship with the Gods-ancestors, their duty to the Family and their divine opportunities and skills, which they can achieve through natural self-enlightenment and self-perception. Only when the man with the bright sunny soul practices natural self-enlightenment, he gradually realizes the next human truths. Eternity of the soul and the existence of the Immortality of the body cannot be established through disputes, verbal debates, because they do not have access to reality outside the material world. The more material knowledge is mixed with the natural self-cognition, the less truth a person can realize. The more person is able to deepen into natural self-awareness, restraining the propensity for disputes which are similar to the minister of material knowledge, the easier for him it will be to open the treasury of Gods and get indescribable eternal spiritual truths. If a person has doubts in himself, then his natural self-awareness is polluted by prejudices, and he gradually abandons the practice of self-enlightenment and does not even reach the level of a RAtional person. But the Truth does not become different because of this fact. It can only be forgotten. And it is obviously that you don’t want to live in the dark, do you? 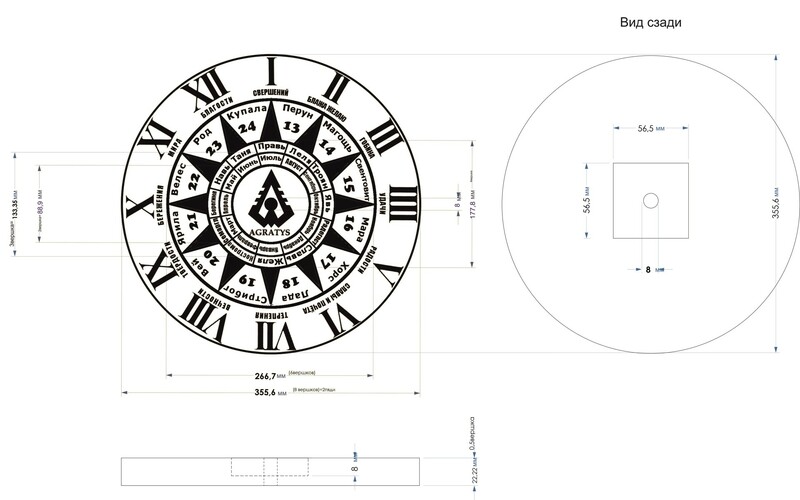 Our development refers to the chronology, to the mechanical calendar mechanisms and to the new (long forgotten) Vedic clock dial, on which the 12-ray astrological Star of the God Pantheon of Lord Ra is displayed. 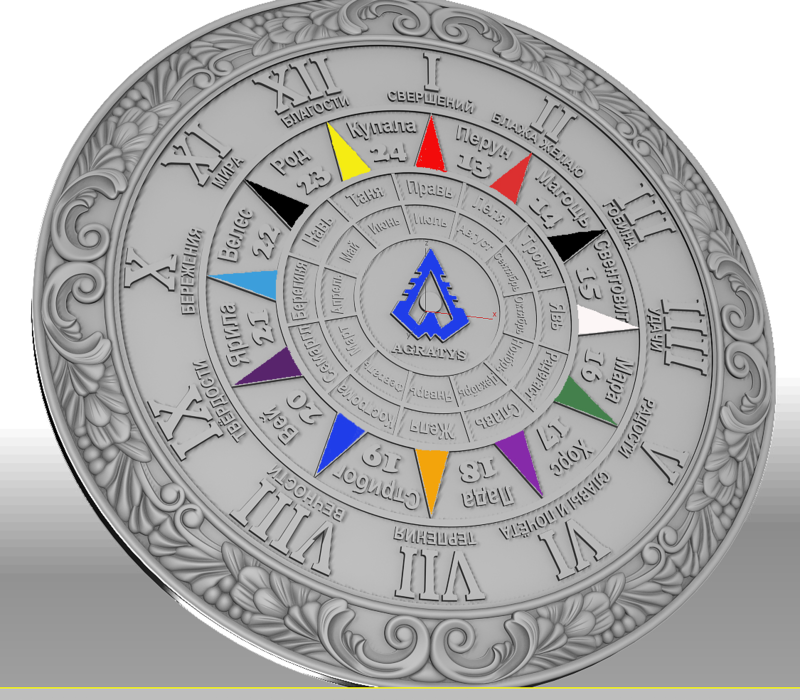 The unique Agratys model can be used in the manufacturing of wrist, pocket, desktop, floor, wall or other watch devices with an indication of the Vedic Pantheon of the Gods, tied to the months and years as on the Agratys Watch. It is known that before the christening of Kievan Rus by Prince Vladimir, the Slavic Pantheon of the Gods included 12 main patron gods and 12 secondary gods - this is evidenced by archaeological finds, including ones founded near Shumskoye village in Kiev region. The Vedas mentioned the same number of supreme Gods. 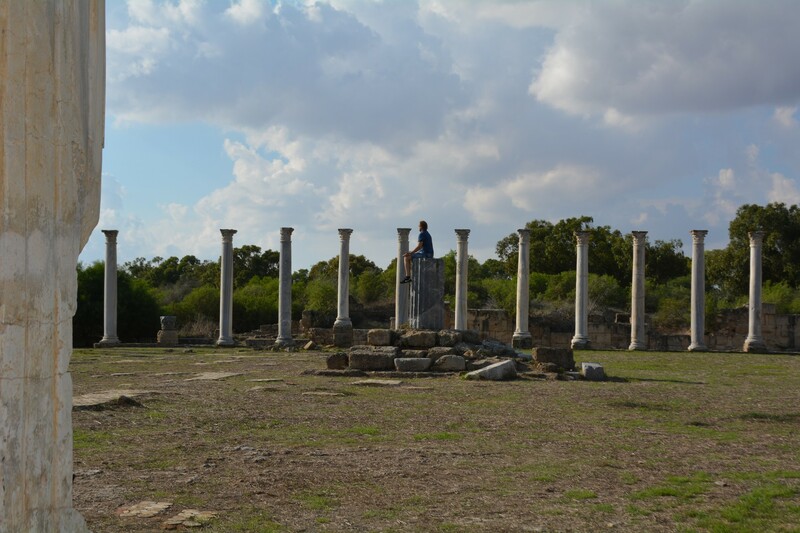 12 statues of the Gods were also established on the forum in Ancient Greece. In the younger Edda there are mentioned 12 Ases-Gods living in the heavenly Asgard. The number 12 coincides with the number of months in the year, and every month is subordinated to a certain God-protector and one of the elements: fire, earth, air or water. This pattern was used by our ancestors as a basis of the ancient Pantheon of the Gods. This same pattern is also placed in the basis of Vedic dial of Agratis watch. 24 God in the Slavic Pantheon of the Gods is not chosen by chance. Many people know that "24" is the number of the Sun. That fact was known both by Egyptians and our ancestors, Slavs. It is known that the sunrise is observed in one constellation for 2000 years, after it the sun rises in another constellation, and after 24,000 years the Sun makes a full circle. That is why our ancestors were allocated 24 zodiacal constellations. The number "24" was put in the duration of the day and, at the same time, served as a basis for the Pantheon of the Gods. The entire Divine Pantheon of the 24 Gods is located in the sky. These are, first of all, 12 planets, which were called earlier by the names of the Gods, and 12 constellations, also having Divine Names. According to the Vedas, the source of everything is fire, so the beginning of the year can only take place in a fiery month: March, July or November. And since the holidays of Prav’ and Perun, the main gods of the Pantheon, are in July, and the word "first" (in Slavic) originated from the world “Perun”, the year really begins on July, 1. Thus, the Solar Calendar on Vedic Agratys Watch also begins on July, 1. Slavs, as it is known, always has the feast of the Goddess Prav’ on the first day of the first month (July 1) at one o'clock in the morning. She is the messenger of the New Year (Novoletie). During the Kupala holidays at the end of June the symbolic wheel, indicating the end of the cycle, is still used, and that fact proved that the beginning of the year falls on July 1, after holidays in the name of god Kupala. The second day of the second month at two o'clock in the morning is the holiday of Lelia, the third day of the third month, i.e. September at three o'clock in the morning - the Troyan holiday, etc. (see Agratys Vedic Calendar). By the word, the fact that the Russian equivalent of the word "three" originated from the name of the god Troyan and coincides with the third month, once again proves that the year really begins in July. That means that the hierarchical location of the Patron gods on the dial of Agratys Watch is right! (см. Календарь Агратис). Agratys Magical Watch – 24-hour, normal stroke, but at the same time has absolutely stunning properties which are absent in another clockworks. The watch allows its owner to know in what months, days, and hours it’s necessary to praise and honor one or another patron God, to define the "True Name" of person and members of his family. The watch also gives an opportunity to see the exact Divine time – the interval of the day during which the creativity and productivity of a person increases many times. And after determining your Divine time, you can use it for achieving the immortality (the first purpose of the Divine Cone). Agratys Magical Watch is a vivid, alive talisman that gives its owner any talent or skill that a person has not had before, serves him as a guard against barbarism, foolishness and different mistakes. This artifact can be decorated with stones, signs, images of Gods-protectors, whose names are included in the names of people. Watch differs from the usual amulets with special sacraments of its manufacture and the great energetic power of the images fixed in it by the creator and the main Egregor. Due to inner alive measures the artifact builds the surrounding space in such a way that the person successfully makes everything he starts up. The purpose of the watch is also to ensure that people, objects and things which were in the "war" conditions, harmonize and do not interfere the owner of the Watch to achieve his goals. As you know, there is such a science as onomastics, which deals with the study of the origin of names. The Russian scientist Pavel Florensky, who worked for a long time in this field, showed in his work "Names" on the basis of a rather extensive factual material that the name given at birth forms a "typical personality warehouse". And such outstanding thinkers as Bulgakov, Losev and Uspenskii in their writings have proved that the name determines the person's purpose in life and his role in society. These great minds managed to establish that names contain predefined events and the rhythm of their repetition. This was known to our Vedic ancestors. They knew that the formation of human destiny begins at the moment of his or her name-giving. And if the name was given (chosen by parents) incorrectly, a person will experience many "surprises" and disappointments in life. The fact is that the physical name of each person carries in itself not only its sacred meaning, but also the sound code (mantra). The numbers and dates - this is the code of the Soul, which is given to the person for all his subsequent incarnations. It is through this code (name) Gods can influence a person. According to the ancient Vedic traditions that have come down to us from the Asuras, the name of a person must consist of at least two names of Protecting Gods, since man is usually born in the year and month of his former Gods-protectors. These Gods are able to help a person and transfer to him their own possibilities. Without the knowledge of his true and eternal name, it is difficult for a person to regain the opportunities he had gained in past lives and it is difficult to recall the time when he was God and had Divine abilities. Even in the Gospel it says: "Life is by name, and not name is by life." The name also affects the choice of profession and the character of the person. The name given to a person at birth forms a "typical personality warehouse". Giving a divine name to a person, we bring him closer to achieving the immortality of the gods (the first goal of the first stake according to the ancient Asurian (Slavonic) traditions), and we guarantee him the help and patronage of the Gods who are inactive if their names do not sound in the person's name. Without a divine name, a person will not discover any ability in himself, in his life, not one Divine achievement will never happen. Without the Divine Name man will forever remain anonymous, far from the gods, and cannot fulfill his duty to his Homeland and Family. Only after taking the ancient name unlimited horizons of the growth, evolution and perfection will open before the person, and he gets the opportunity to receive everything from his God-protectors that they have themselves. It is thanks to the synchronization with the measures of the Names it will be impossible for the human to imbalanced, and all the achievements acquired by him in his life will never be lost in future reincarnations. 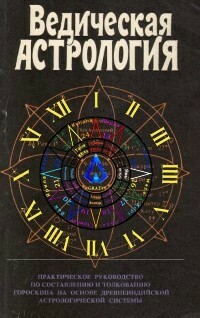 Therefore, in order to return of Divine opportunities, a person must give up his modern pseudonyms and regain the divine names - and on this way you will be fully assisted by the Vedic Agratys Magical Watch.The technique of figuring out the name, which formed the basis for the name system "Imenoslov", was tested by us many times. The Pantheon of the Vedic Gods (Pantheon Ra) consists of four worlds, and the main Gods answer for them: Prav’, Yav, Slav and Nav. 1. The World of Yav consists of four Gods (Hors, Veles, Sventovit, Wei) - these are the periods of a person's life in the manifested world. 2. The World of Prav’ - the world of seven paths, consists of two quads of the Gods (Semargl, Lelya, Zhelya, Tanya, Radegast, Troyan, Bereginya, Kostroma). 3. The World of Slav is the world of kingdoms, patronized by Perun, Lada, Rod, Mara. 4. The Nav World is a world of elements (Yarilo, Magoshch, Stribog, Kupala). "True name" is given to the physical (alive) body of a person according to this gradation and classification and consists of two names of the patron gods: the patron of the month and the patron of the year of human’s birth. For example, the name Svyatoslav reflects the birth in the year of Slav and the month of Sventovit, Pravosvet – in the year of Sventovit and the month of Prav’, Horonav – in the year of Nav and the month of Hors, etc. After taking a true name, consisting of two names of the Patron Gods, a person also accepts with him the living numbers (measures) of the Gods and, thus, receives the protection of these Gods, their divine opportunities and destiny. Person with a divine name, before becoming a God, witnesses amazing divine events during his life: he ceases to grow old, he gets omnipresence and reveals magical powers. Today, someone who does not know and does not have a name, reaps another's destiny. Is it possible to fix that? 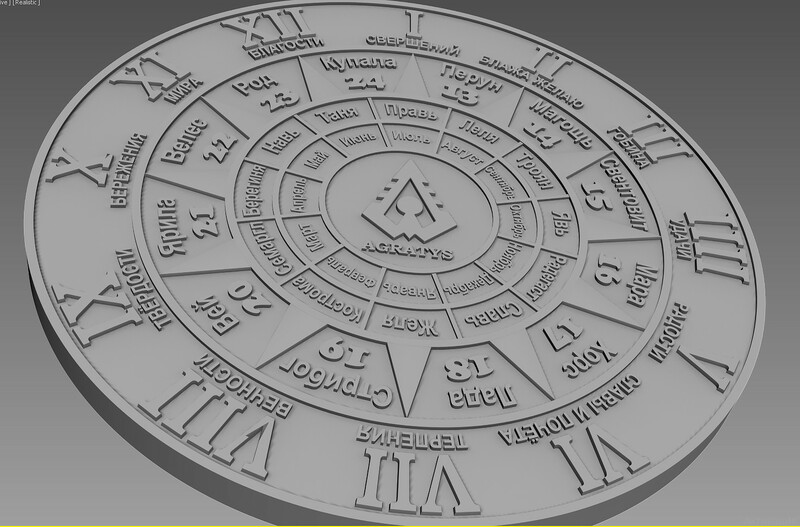 You can inquire your "true name" using the astrological star of the god Ra, placed on the Agratys Vedic Watch. If you tie the astrological star of the Pantheon of god Ra to the existing Gregorian or previous Orthodox calendar, it becomes a Vedic watch and allows you to determine your real name. In the Vedic Agratys Magical Watch each point of the circle corresponds to two meanings. The first point corresponds to July. Numbers 1 and 13 denote the month number of the year. Since the year of our ancestors began in July and everything in our world began with fire (July - the fiery month), then the countdown is in “summers”. The number "1" of the Goddess Prav’ means that her feast was on the first day of the first month, and the ritual for her should be held at 1 hour 00 minutes (1 a.m.). Similarly, for Perun. His number 13 meant that the 13th month (also July) on the 13th (ie July 13) is his holiday, only in the second round of the two-year cycle, and the time of the beginning of the festive ritual of Perun is 13 hours 00 minutes (1 p.m.). Date 1914 means the year patronized by the Goddess Prav’, but this point also falls on all the years that differ from 1914 to 24 years, and these years also belong to the Goddess Prav’. Date 1926 means that this year is under the auspices of Perun. This point also belongs to all the years, differing from 1926 to 24 years. If the date of birth is later than 2033, you need to subtract from the year of your birth the number 24 or 48 to get the number available in the Vedic Watch, God, to whom the received number will correspond, is your patron. It will be the second part of your true name. The first half of the name will be determined by the name of the patron God of the month of your birth. Presumably, the person was born in early July 1976 - then his name will consist of the name of God Sventovit (patron of 1976) and the patroness of July of the first round in the Pantheon - the goddess Prav’, i.e. PravoSvet or PravoSveta. If a person is born from 1 to 12, he gets the name of the God of the first circle. If the date of birth falls from the 13th to the 24th, the person is given the name of the God of the second circle. All those born in the period from 25 to 30 (31) - receive the name of the patron god of the second month if at present the patron of the year is (was) the God of the second circle. And if the patron of the year was the God of the first circle, then the person receives the name of God of the first circle of the next month. In the Vedic (Old Orthodox) calendar all months had 30 days (30x12 = 360), the remaining 5 days did not belong to any month and day of the week. They were sacred holidays and celebrated for five days in a row. Possessing such an artifact as the Agratys Magical Watch you will be able to know your real divine name and, having received it, open yourself to the eyes of the gods. 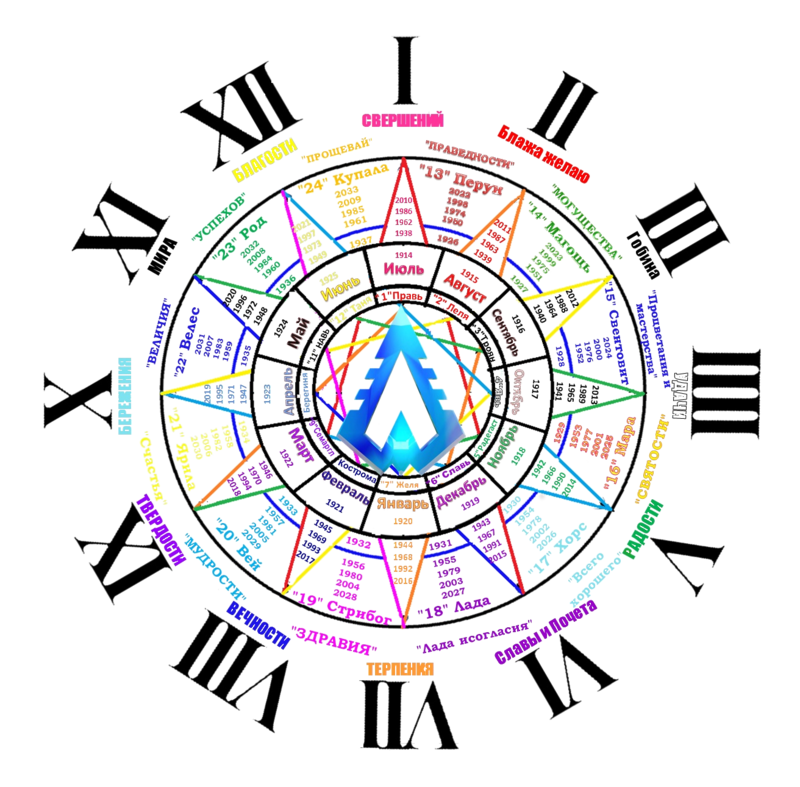 It is through synchronization with the measures of his patron gods the owner of the Agratys Watch can calmly attain the divine goals of the nine kins: immortality, perfection, creation, creativity, metamorphosis, harmony, all-reach, all-comprehension and union with the Almighty. In order to provide services, answer questions, fulfill your wishes and requirements, you need information such as your name, email or phone number. The SITE can use this information to answer questions, as well as to contact you by phone to provide information about the services offered and advertising campaigns. If you receive a request in the form of submitting a form filled in on the site, the SITE may need to contact you for more information that is necessary for your service and answer the questions of interest. SITE undertakes not to transfer this information to third parties without your permission, except for the information necessary to perform your service. For your part, you grant SITE the right to use any information you provide to perform the above actions. The transmission of personal data in any form (personally, by phone or over the Internet) is always associated with a certain risk, since there are no absolutely reliable (protected from malicious attacks) systems, but the SITE takes necessary adequate measures to minimize the risk and prevent unauthorized access, unauthorized use and distortion of your.